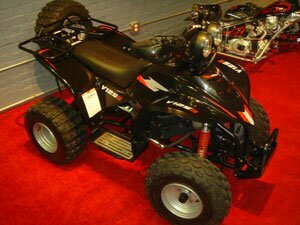 Raceway ATV would like to introduce our new 125R sport ATV. 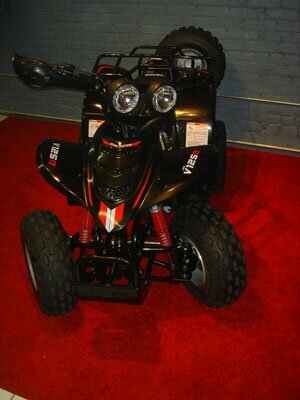 We have found another great import 4 stroke ATV with durability, style and power. Raceway's 125R ATV has just about everything you could ask for in a mid size 125cc ATV. If you are looking for style this ATV will win you over from front to back! This ATV is a solid built fully automatic ATV that is built to impress and last. 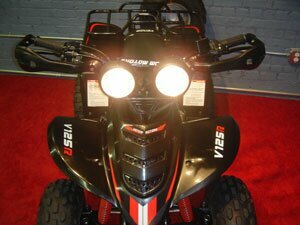 The 125R has a cool looking set of front headlights that will light up any trail for a great distance. These firm, bright and great designed headlights are great for safety and also allows ATV fun to continue well after the sun goes down! It's sporty look is combined with a strong and fit rear rack with a spare rim and tire attachment. (Spare rim and tire included free with any purchase of Raceway's 125R.) Some other great safety features on our 125R ATV are it's stylish left and right side hand guard protectors. These hand protectors are made of a good quality flexible plastic that is a super plus for any tight ATV trails. These protectors are great for your hands when is comes to branches and other small objects. 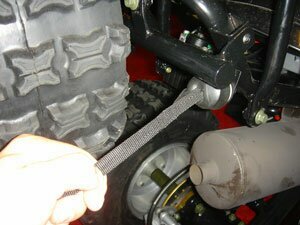 The 125R ATV also has a kill plug tether cord in the rear of the ATV and a speed limiter screw to control speed. 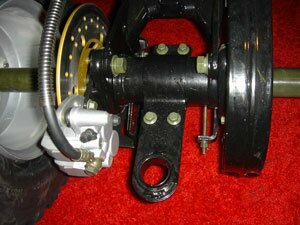 The 125R ATV also has an easy to use safety brake lock located on the right side hand brake lever. 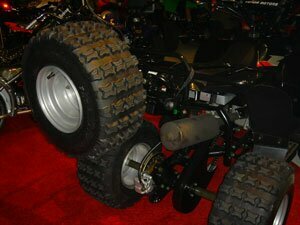 This ATV has really impressed us with is well designed manual choke system and it outstanding turning radius. 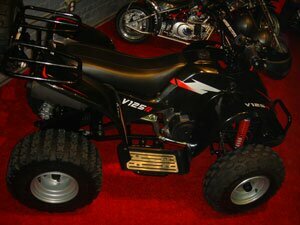 This mid size 125cc ATV also comes standard with an adjustable front and rear hydraulic suspension. It's rear disc brakes and soft hand brake levers makes the 125R ATV very easy and responsive while operating. A great riding ATV must have a great suspension, and the 125R ATV has a true double a-arm front independent suspension! The 125R can easily be compared to any ATV in it's mid size class. This ATV is built with the quality of a name brand and really is a step above most imports out there. With the 125R you really get your money's worth and then some. With a Max weight of 300 lbs. and a seat height of 27" this is an ATV that fits mid size riders just right. The 125R has a push button electric starter with a back up kick start located on the right side of the ATV along with it's roomy foot guard panels. The 125R ATV has a top speed of 40-45 mph. Raceway ATV's 125R comes with an easy to understand setup manual, full factory service manual and parts catalog. With all the great safety features, power and looks of our new 125R, We at Raceway ATV are truly excited to bring our customers a great quality ATV for a great price, and the 125R is just one of our new products added to our line of ATV's. Let us do the research and you do the riding! Raceway ATV guarantees satisfaction with our 15 day return policy. Raceway ATV is a leader in the ATV import industry. With the number one technical support in the business and full line of replacement parts why chose anyone except Raceway ATV! We at Raceway ATV know that there is a lot more to a sale then just the purchase. Raceway ATV has earned it reputation by its professional staff and standing behind every product that we sell. If you give us the chance we will show and prove to you why everyone is saying Raceway ATV is the best online dealer in the business.